10) Eli Givens Palo Alto (CCS) 10.79/21.54/Nate Esparza 62'5.5"/177'7"
9) Michael Gonzalez Lodi (SJS) 16'0/Erika Malaspina Pacific Collegiate (CCS) 13'2"
8) Darius Thomas St. Francis (CCS) 7'0"
4) Darius Carbin Mt. 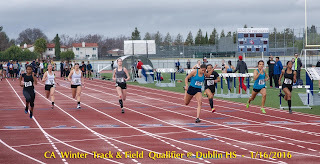 Pleasant (CCS) 47'4"/7'1"
3) Isaiah Holmes Oakmont (SJS) 23'9"/48'3.25"/7'0"
1) Elena Bruckner Valley Christian SJ (CCS) 53'5.5"/182'8"
Her official time at the University of Washington Invite was 15:09.31 just missing her outdoor PR of 15:08.61 from 2014. According to Dave Monti, Conley has now run the following times in the last two months. Feel free to post your question in the comment section below. You can also ask questions that can be answered by frequent visitors to this site. 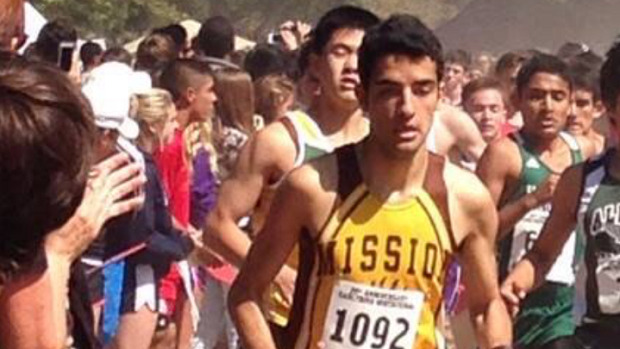 Today we chat with Mission high school senior runner, Salem Bouhassoun. 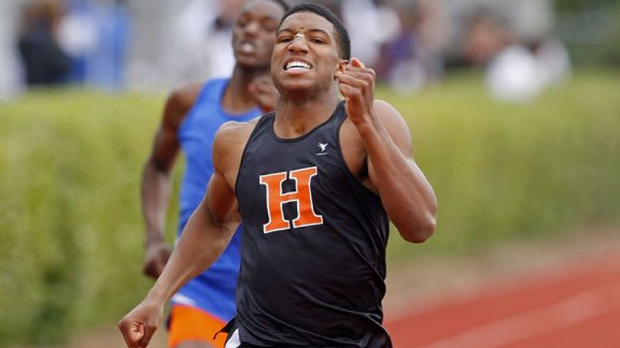 He ran PRs of 1:59.27, 4:20.88 and 9:14.67 during his junior track and field season. This past cross country, Salem had top 5 finishes at the Hoka One One Earlybird, De La Salle/Carondelet and Stanford Invitationals. 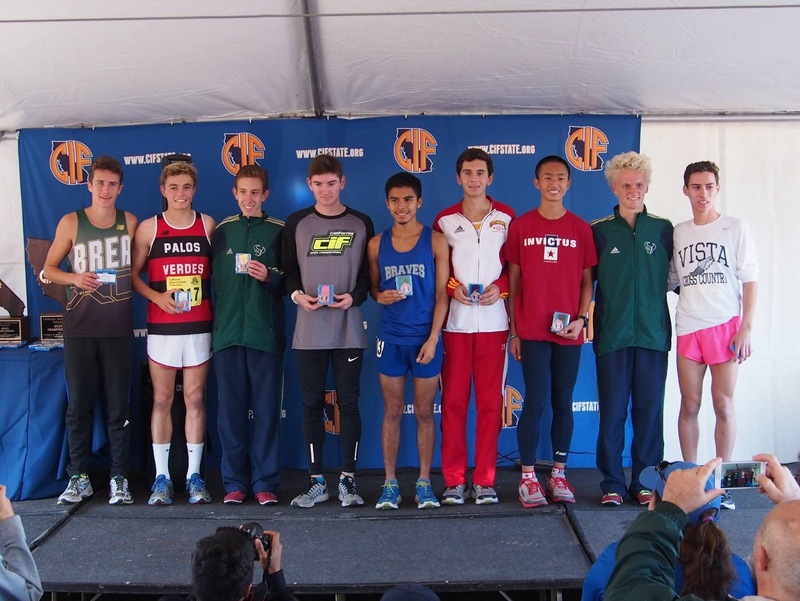 Following his victory at the San Francisco Section meet (photo to the left courtesy of Thomas Benjamin), Salem finished in 19th place in the Division III race at the California State Cross Country meet. Salem's twin sister, Nour, was featured in an article titled "The Chilling Rise of Islamophobia in Our Schools." which you can read at this LINK that details the hardships of Syrian refugees. 1) Where were you born and when did you come to United States? How much of an adjustment was it coming to a new country? I was born in Syria, in a small city named Swieda. I lived there for 14 years and immigrated here the summer right before my freshman year in high school. The biggest adjustment I had to go through was learning English so I can make new friends, meet new people, and figure out what I want to do with my life. It felt hard in the first couple months because I missed my friends, relatives, and country. But that motivated me even more to learn English faster so I can create a new social life for myself. I am glad I was able to overcome that quickly and adapt to my new environment within a year. 2) What sports have you played aside from cross country and track and field? When and how did you start running? I played a lot of soccer as a little kid at school during PE classes or in front if my house. Sometimes my friends and I would play with water bottles or soccer balls made out of socks just because we used to play all the time and sometimes we couldn't find soccer balls available. In 7th grade I found my talent in swimming after I learned how to swim in one day. I became so good at it and had the dream of coming here to the U.S to become a famous swimmer. But my parents couldn't spend money on me swimming and my school did not have a team so I had to choose a different sport. As a freshman I played soccer and then wrestling. The soccer coach used to make us go to some of the XC races so we can get more fitness that will help us in soccer, and thats is how I was introduced to XC. 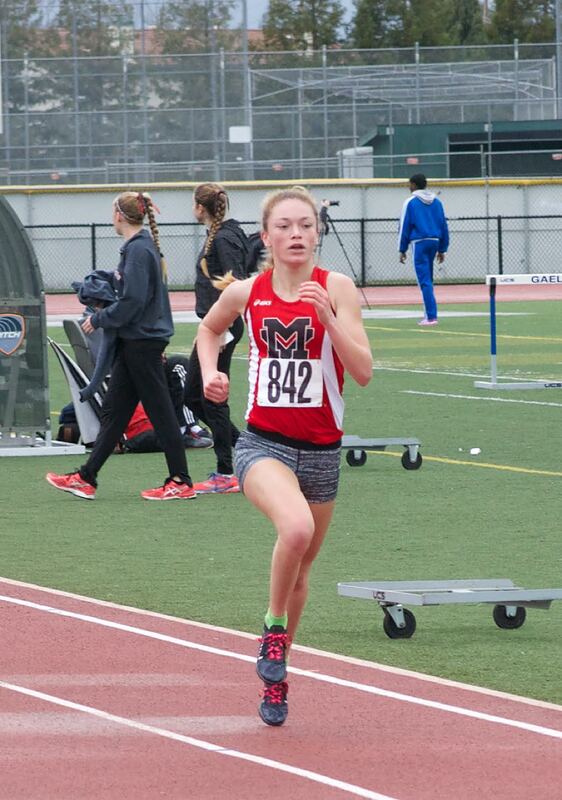 When I became a Sophomore, I decided to focus on one sport so I chose running to be active throughout the whole year since there are two seasons with cross country and track and field. 3) What were some of your highlights from your sophomore seasons in XC and TF? It was very motivational for me to place 6th place at the all-city finals and make it to the State meet in Cross country even though it was my first year and I had only been running for about 2 months at that time. That was my biggest highlight in the sport and my teammates were so excited for me that they threw me in a mud puddle after the race. That proved to me that I have a lot of potential in the sport. 4) What about from your junior seasons in both sports? As a junior, I saw a tremendous improvement after I learned that off season mileage makes a big difference on your season performance. I improved by 2 minutes and 18 seconds in XC, and went from placing 186th as a sophomore to 45th at state finals. 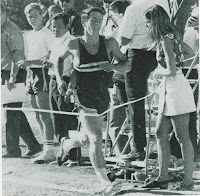 In Track, I was even more fitter, and I was much more experienced when it came to racing. I also improved by a minute and 4 seconds when I went down from running 10:18 as sophomore to running 9:14 as a Junior. I was also the the city section champion in the 1600m and the 3200m which I consider a big accomplishment. I was very happy that I also got the chance to go to some very competitive meets and get the chance to race at state finals and against fast guys throughout the whole season. 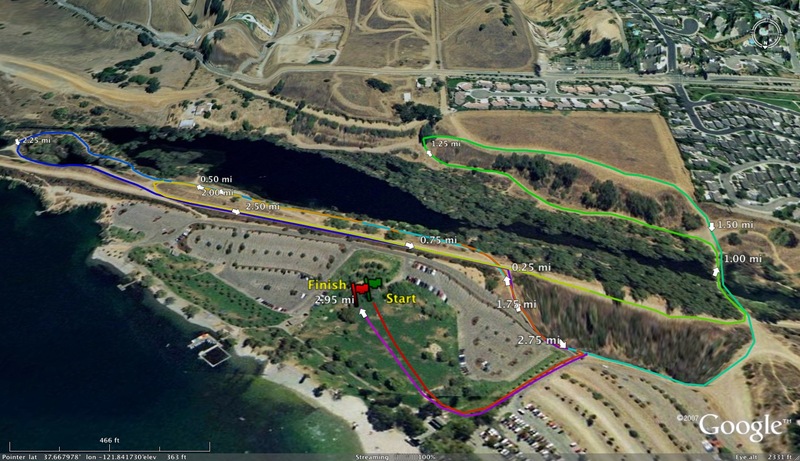 5) What do you feel was your breakout race that put you on the running map in Northern California? I think my breakout race was at the Arcadia invitational when I ran an unexpected 9:15. My previous personal record before that race was only a 9:29 so I was not really expecting to shave off that many seconds two weeks later. 6) How has your training changed from your sophomore year to now? My sophomore year, I was only running about 20 miles a week with one workout, and sometimes only training 3 days a week. I used to come into my season out of shape. I also still did wrestling in between XC and Track during that year. But now, I average about 60 miles a week and I am always fit and ready early in the season from the miles I run in the off season. 7) Who coaches you and how has he helped you develop in the runner you are today? My school never had a history with running. I was the only serious runner on the team as a junior with only a couple other runners who used to show up once a week for fun. I met Coach Octaviano Romero through my old teammate when I was a sophomore. He works for a sales company that is an hour a way from the city but is really into running and loves to coach. After his nephew graduated, he noticed my talent and decided to stay with me to coach me. He is working right now as volunteer coach for our school coaching me and one other sophomore named Mateo who has recently been stepping up. 8) What does a typical training week look like for you? Any double runs? Longest run? Typical pace per mile for most of your "easier" runs? Saturday: a race or another workout. 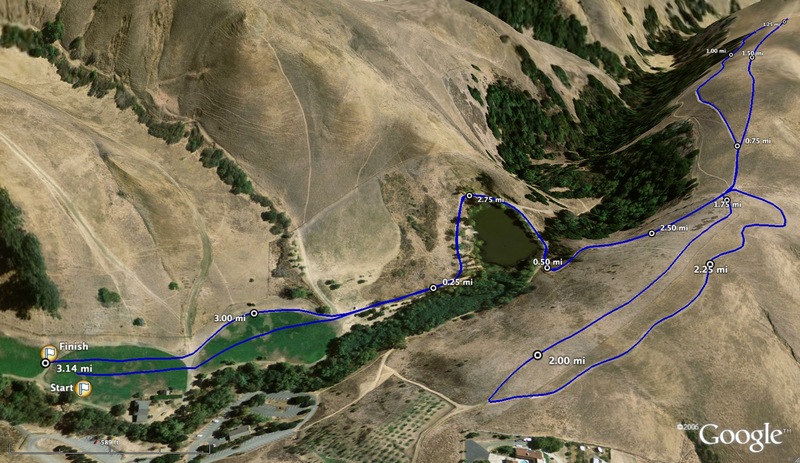 Sunday: Long run that ranges between 12-15 miles at a recovery pace. Total miles would be about 55-65 miles. 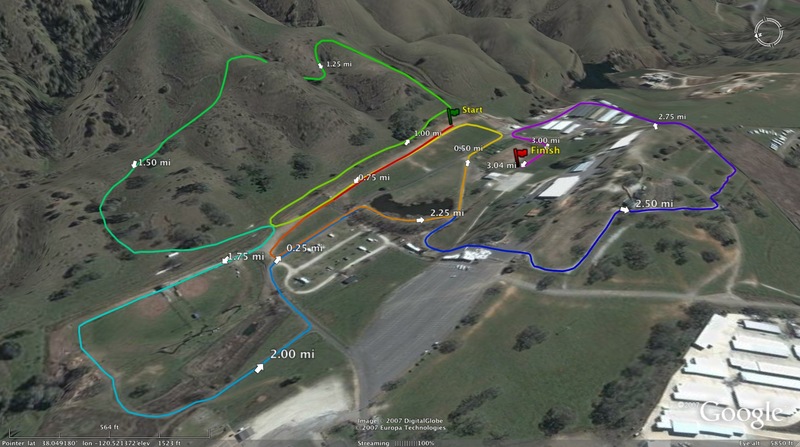 9) Favorite XC course? Favorite XC meet? Favorite XC workout? Favorite long run? Favorite opponent(s)? 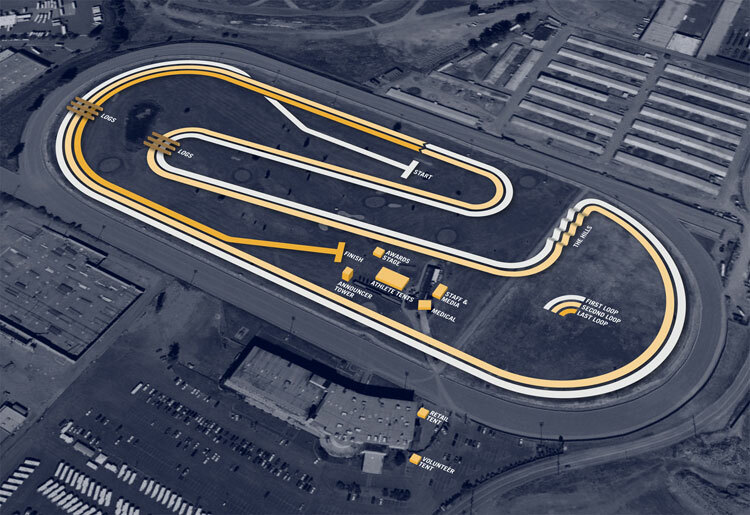 Favorite track event? Favorite track invite? Favorite track workout? Favorite free time activity? My favorite Cross Country course is the Stanford golf course. I love the grass there and the course is very flat and nice. 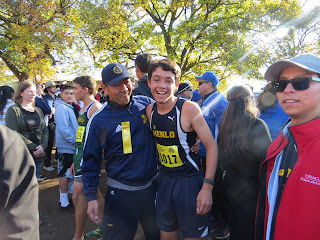 Favorite XC meet is the State finals just because I always have fun going down to Fresno to see my fiends from other schools and race the day after, although I really hate the Woodward Park course. My favorite XC workout is long hill repeats, I feel that I was supposed to do more of those the past season. 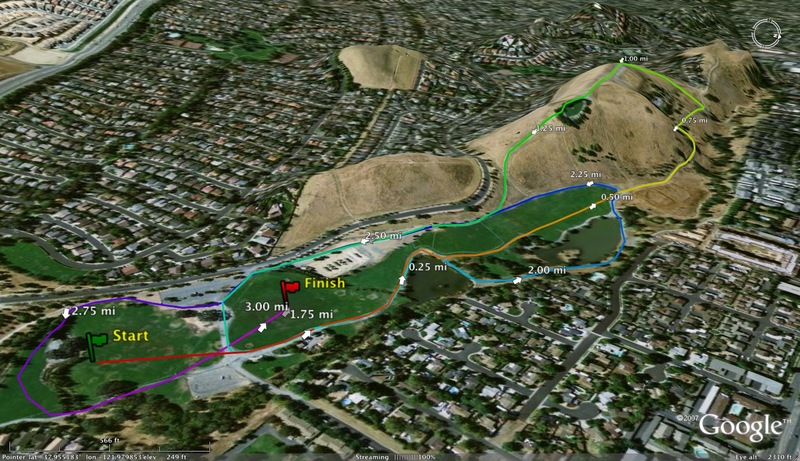 My favorite long run is running around Lake Merced then through Golden Gate Park. There are some nice trails and good trees to run by. I always meet a lot of runners on my way. My favorite Track workout is 400 repeats and we would usually do 18-20 of those at target 3200m race pace. My main event is the 3200m. My favorite track invitational is Dan Gabor. I love the feeling I get there and the weather, plus it is the first Invitational of the year so I'm always excited for it. My favorite opponent is Eduardo Herrera (Madera South) even though I don't race him a lot or know him that well, but just because of how respectful and humble he is. I love my first opponent and section competitor Luis Aragon. He's very chill and our competition has made us great friends. Although I am looking forward to getting to know more elite runners that I will be running against more often this season like Sean Kurdy, Michael Vernau, Cooper Teare, and others. During my free time I love to swim. It brings a lot of memories to me. I also love bowling and I am really good at Yoga. 10) I believe you are in the midst of making your college decision. How much will running be a factor? What else do you feel is important for you when it comes to choosing your next school? Running is going to be a big but not the only factor in terms of choosing my future school. I believe that I still have a lot of potential left in me and I want to make sure that I am picking the right program that will help me develop as a runner and help me achieve my future goals such as running and representing my country Syria in the Olympics. At the same time, I am looking at other factors like the academics, location, class size, cost and diversity. In the end, running will be a second priority for me as I want to focus on getting a degree at a medical school after excelling in a kinesiology or biology major during my 4-5 years at an undergraduate school. Therefore, I am looking at the best combination between all of these factors. 11) What are you most looking forward to this upcoming Track & Field season? What are some of your goals? I am looking forward to staying healthy and injury free throughout the upcoming Track and Field season. Other than that, I think it would be nice and achievable for me to break the San Francisco section 3200m and 1600m records before I graduate, and maybe run a sub 9:00 for the 3200m and place top 10 at state finals if possible. I am really thankful for my Coach Octaviano Romero who got me to be where I am today. I also want to thank you for reaching out to me. I love reading about other dedicated runners on this wonderful website and learn about their stories. Other inductees include legendary Mira Loma/Del Campo coach Bob King, Sacramento's first state champion, JFK's Clifton West, ultra-marathoner Jim Howard and race director Greg Soderlund. 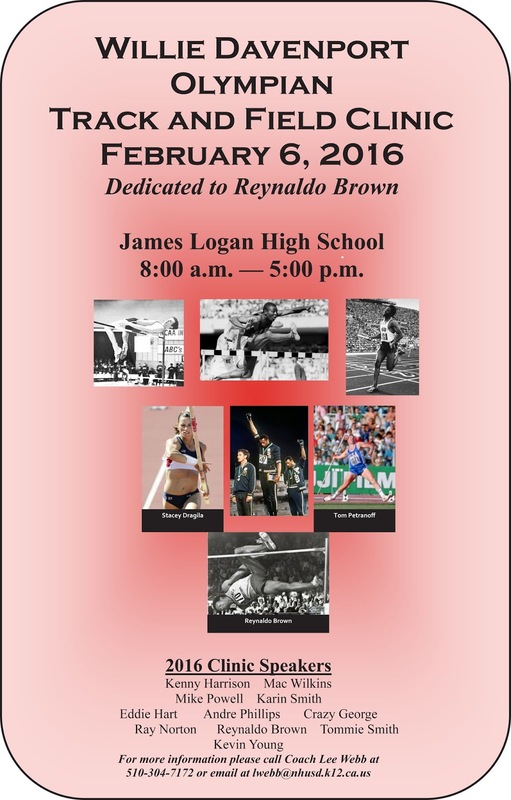 For more information on all the inductees, go to the link below which includes more info about the awards presentation on Saturday, February 27th. He vaulted 17'6" last year as a sophomore. Definitely a do not try this at home. Long Jump-Isaiah Holmes Oakmont (SJS) 23'9"
Triple Jump-Isaiah Holmes Oakmont (SJS) 48'3.25"
High Jump-Darius Carbin Mt. Pleasant (CCS) 7'1"
Pole Vault-Michael Gonzalez Lodi (SJS) 16'0"
Discus-Nate Esparza Amador Valley (NCS) 177'7"
Triple Jump-Kali Hatcher St. Mary's Berkeley (NCS) 39'0.5"
High Jump-Olga Baryshnikov Prospect (CCS), Julie Zweng Scotts Valley (CCS), Kaylee Shoemaker Corning (NS) 5'6"
Pole Vault-Erika Malaspina Pacific Collegiate (CCS) 13'2"
Shot Put-Elena Bruckner Valley Christian SJ (CCS) 53'5.5"
Discus-Elena Bruckner Valley Christian SJ (CCS) 182'8"
He sadly passed away at the terribly young age of 24. He inspired many runners during his racing career and still inspires people to this day. Who inspires you to practice and compete at your best? Best result overall for both meets? 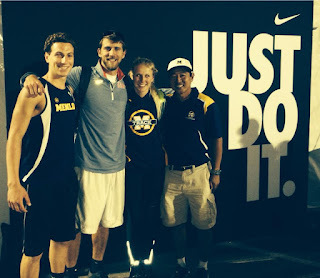 Today we chat with Menlo School XC, soccer and TF coach Jorge Chen. 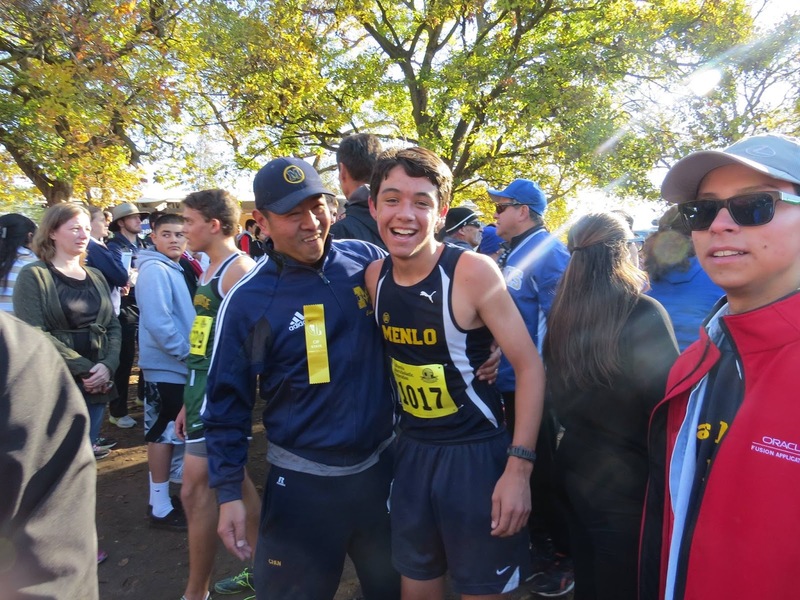 During his time at Menlo School, Jorge has accumulated many individual and team league and section championships. Over the past few seasons, Jorge has coached double CCS track and field champion Maddy Price, Footlocker finalist Lizzy Lacy and the NorCal sophomore runner of the year, Robert Miranda. 1) What sports did you play before and during high school? What are some of your proudest achievements in sports during your pre and high school days? --- I played soccer, and ran track and XC in HS along with playing tons of sports just for fun! Proudest moments were in Freshman XC when we won Artichoke Invite as a Team, Coach Dooley was so proud of us youngens...Also winning CCS Top 8 in the 4x400M when we were seeded last (32nd) going into the meet, we defeated #1 seed Riordan that night...And coming in 2nd at Stanford Invitational in the 4x100M. 2) Who were the coaches that had the biggest impact on you as an athlete? What did you learn from them that you use to this day? 3) Highlights from your four year college experience at Stanford? 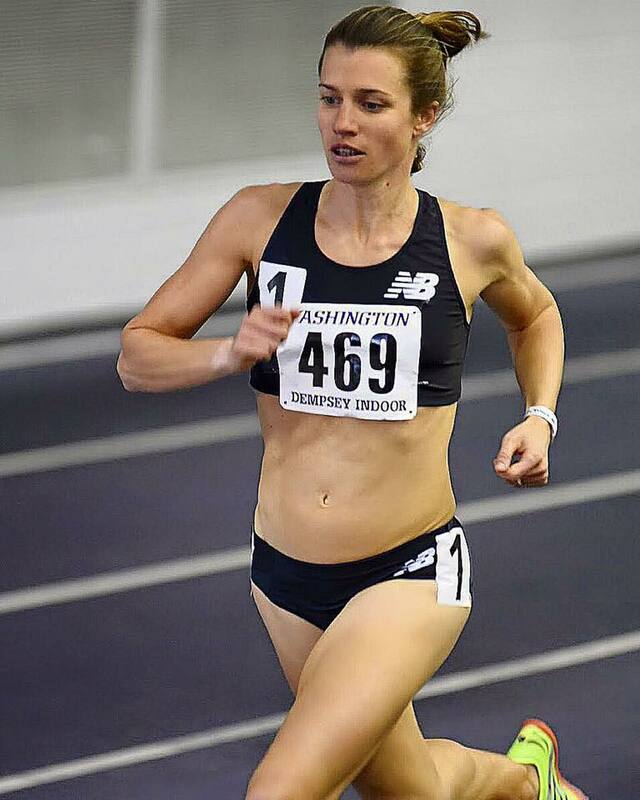 --- Not many athletic highlights here unfortunately since I ran 2 years of Track and due to injuries switched over to Crew my last year at Stanford. Our boat actually came in 2nd in Pac-10s for Lightweight 4+s. But I've built many long-lasting relationships with my teammates that I still treasure today. 4) How did you get your start in coaching? What was your first coaching experience and what did you learn from that first season? 5) How long have you coached at Menlo? What sports have you coached at the school and what is the most sports teams you have coached in one school year? --- I've been at Menlo for 14 years now and I absolutely love the kids, parents, and my colleagues. I've made Menlo my home and really give my all to them and try to teach my athletes to be great ambassadors to their sport as well as citizens of the community. I coach HS XC, Track and Girls Varsity Soccer along with Middle School XC, Track, Boys & Girls Soccer. One school year I coached 12 sports teams which was crazy...but I took on the challenge and it was a blast! Now I feel a little too old to do that again. 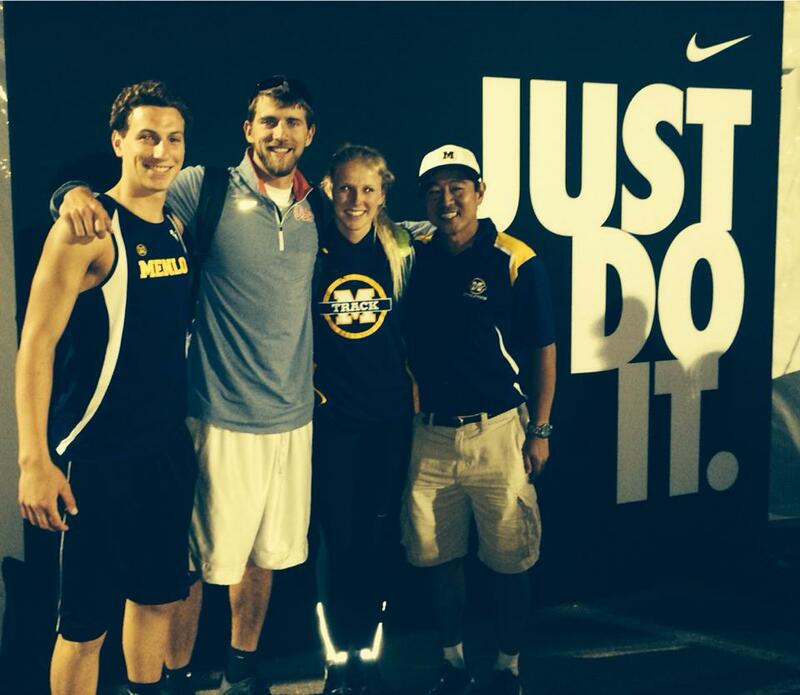 6) Who are some of your more outstanding athletes that you have coached at Menlo and what were some of their achievements? --- There are too many to name since many athletes who didn't go on to run Track or XC went on to do great things in other sports but my main outstanding HS Track & XC athletes were the Parkers (Sam 800M league record holder & Max just a beast), Maddy Price (400M/200M CCS back to back double champ), Lizzie Lacy (D4 CCS Champ & Footlocker Nationals 10th place), and currently Sophomore Robert Miranda (XC & Track distance runner pictured above following his state meet race). I still keep in touch with them and I learn so much about coaching from my athletes as well. 7) Who are your coaching mentors that you lean on for advice during the different seasons you coach? --- You for Track & XC, as well as great coaches like Rob Collins (SLV), Ken Wilner (SHP), and many others. Also, my own staff of phenomenal coaches Sean Weeks (pictured above), Tricia Lord, Tina Lount, & Donoson FitzGerald along with many of my Menlo colleagues (Buffie Ward and the Great Bill Shine, to name a few,) who always give me great coaching advice and pointers to become a better coach. I truly believe that the head coach of a program is only as good as his/her staff. 8) Aside from the training plan that they follow, what would you say are other important factors that are equally as important for athletes? --- I believe in athletes staying healthy by listening to their bodies. And as a coach to actually plan our workouts that will fit the athletes and not the way around. But I am actually very happy that you asked this question since I believe that NUTRITION is the Key to Success in my athletes, especially female runners; and as caring adults, coaches and mentors, we should truly encourage our athletes to not only eat healthy but to eat enough to fuel their bodies! And another thing is to make practice fun by changing things up! 9) How do you feel you have changed as a coach from when you started to now? What do you feel like you do now that has really helped your athletes? --- When I look back at myself 14 years ago, I just laugh at myself. I used to take wins and losses very seriously and personally, but now I truly try to not only teach my athletes the sport and to enjoy it, but the most important thing I try to teach my kids is LIFE LESSONS. If I can change one kid's life through sports, I wouldn't exchange that for any trophy. I believe that my athletes really trust me that I care about them. I spend many hours doing research in running and try to teach my athletes what I've learned with a touch of fun added to it and they really digest it well with good results. 10) What do you feel is the most important part of your job when it comes to dealing with high school students? --- Again, I believe my main job is to teach HS students LIFE LESSONS in order to be great & caring people in this world. To actually make a difference in this world, no matter how cheesy it may sound... :) To be a good teammate since Track & XC truly is a team sport at Menlo, and that there is no shortcut to GOOD OL' PLAIN HARD WORK! 11) What would be your advice for a young coach that is just starting out and what can he or she do to be effective coaches for their teams? --- To not allow your youth or inexperience hinder your coaching abilities. To just truly care about the ATHLETE and connect with them first, then everything else will be added. 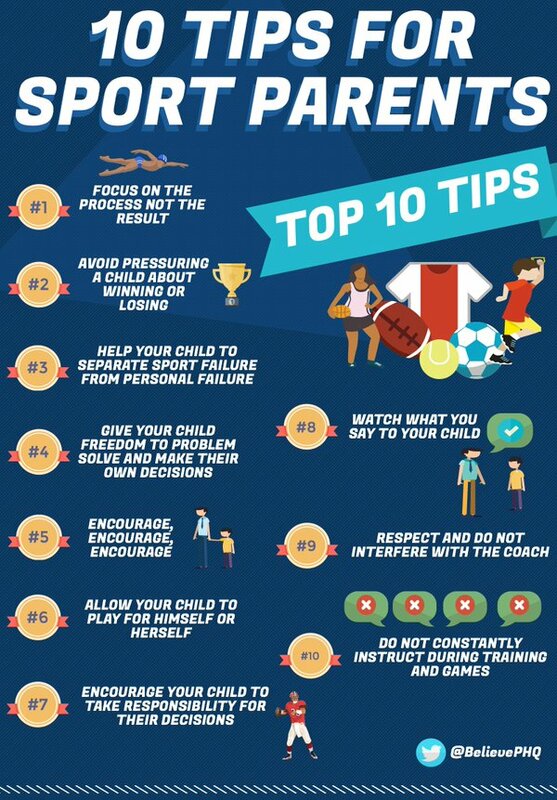 As coaches, we are here to help the kids to learn and enjoy their journey. And don't be afraid to ask for help or advice at any time. We are all in this together to help the future athletes of this country. And one main advice that I live by as a coach is: It's all about the KIDS, not us coaches; as soon as we think it's about us, that's when we become bad coaches. ---Thank you so much for allowing me to share my passion on your blog Coach! We have so much talent around this area and I hope we can all work together to help develop these amazing kids. 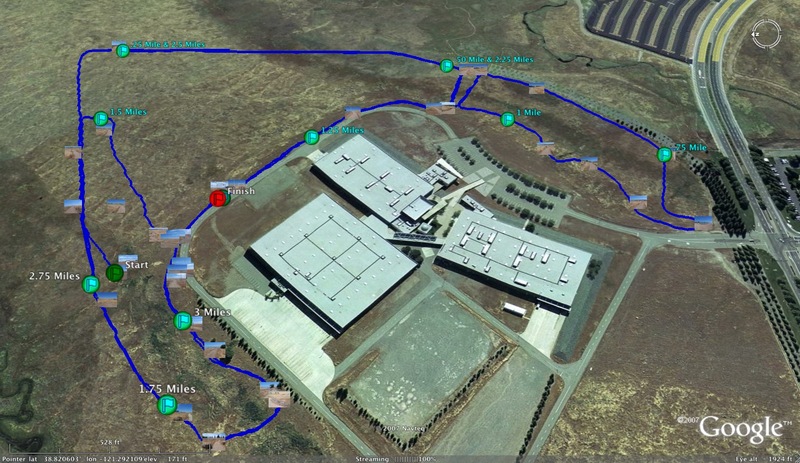 And Thank you Coach for contributing so much to NorCal HS XC & Track through this site! Good luck to Everyone & as my old HS Coach Don Dooley would say: GO RUN 1! The at-large marks have been corrected and updated due to several errors for different events. 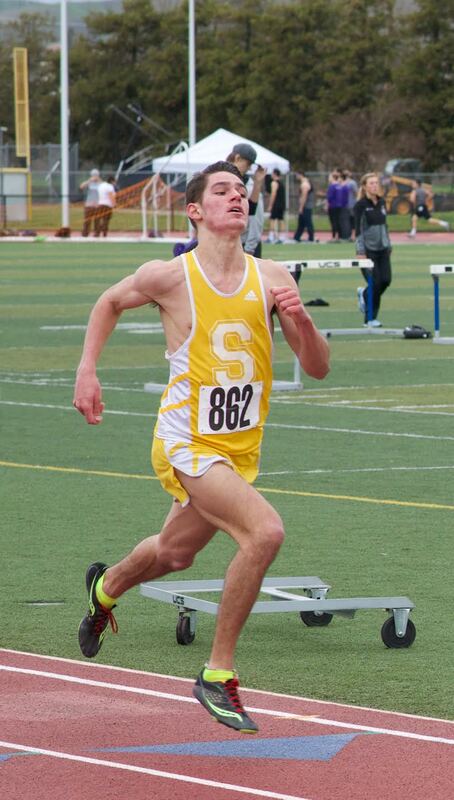 Today we chat with Skyline senior runner, Zachary Katzman. This past season, Katzman had one of the finest seasons by an Oakland Section athlete in recent memory. He won the Ed Sias Large School race in 10:07.8. He finished in 4th place at the Stanford Invitational Division III race in 15:46.5. 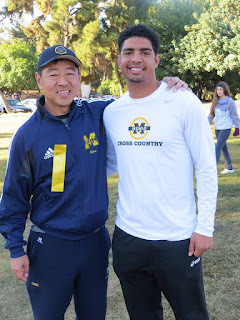 His official high school season concluded at the California state meet where he finished 15th in the uber competitive Division I race (15:25.0). For his efforts throughout the season, Katzman was named 1st team all NorCal. Katzman's PRs during the 2015 Track & Field season including a 4:24.95 mile and 9:20.20 3200m. 1) Looking back at this past XC season, what would you say was your best race? What are some of your proudest accomplishments? This past season was only my second high school cross country season - I ran club track / XC from 6th through 10th grade. By the beginning of the year, I had finally adjusted to the new training and racing styles, and this showed early on when I won the Ed Sias Invitational. Later on, a comfortable 16:00 solo at the Oakland Athletic League City Championships was a great tune-up for the next couple of weeks. However, I think my best race was at the state meet, where I set an Oakland Section record and improved upon my 2014 place (151st) by 136 spots. That performance was quite encouraging for the upcoming track season. 2) What was your training like during the summer? Did you do anything differently than previous summers? Typical weekly mileage? Workouts? During the summer, we mostly did base training. My mileage was around 55-65 miles/week, and most of our workouts were geared towards endurance development. This was similar to summer training in 2014; however, I had trained differently with my club team - more workouts, less mileage runs. 3) Any bumps along the way during your season? Any challenging races that made you even more determined for the next race? I hurt my IT band in mid-September, so I had to cut back on training during the week of Stanford Invite. Though it made the race challenging, the most difficult part was hardly running at all during practice. Luckily, I recovered quickly, so the time I took off was well worth it. 4) What does a typical training week look like for you? Longest run? Typical pace for most of your runs? Training partner(s) or are most of your runs solo? Morning runs? Weight work? *Controlled and easy runs are mileage but at slightly different paces. My longest runs are 14 miles. I usually run 6:00-6:20 pace for mileage. 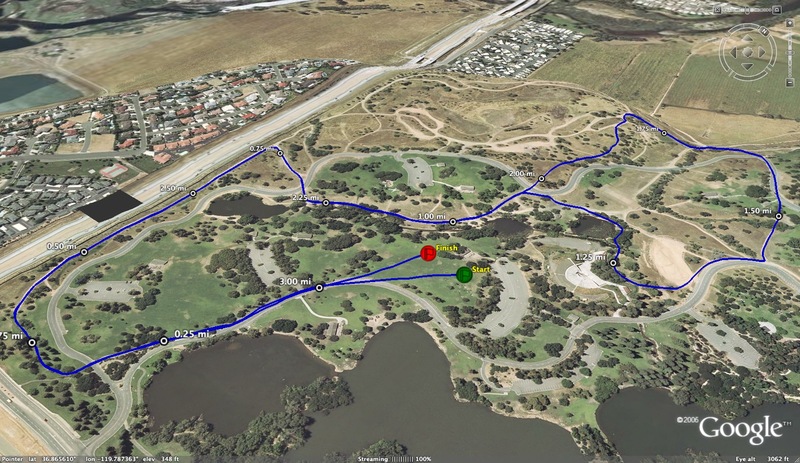 Most of my runs are solo, but we recently started a new system in which a faster pace group runs easy on the next fastest pace group’s controlled run. We do this 1-2 times a week, and it’s been great to run with my teammates more often. I run in the morning primarily for enjoyment. We do several strength circuits and core work each week but no weights. 5) From your own experience, what do you feel like has really worked for you training wise? What changes have you made as you got more experienced as a runner? Training with high intensity - not necessarily greater volume - seems to work for me, but I think this depends on the person. After alternating between track and football in middle school, I got more serious about running once I started high school (still running club). At that point, I started running year-round and got more competitive in racing, rather than doing it just for fun. Since then, I've only made minor changes, although transitioning into high school track / XC was challenging. I think that for most athletes, maintaining the same training style is more effective than routinely making big changes. 6) Who are the people that have been the most influential in your success? How? Coach Willie White, my club coach, played an instrumental role in my development not only as an athlete, but as a person. Over the five years we worked together, he helped me find my passion for running and, once I was ready, pushed me to improve and compete at my best. Coach White continues to be a mentor and never stops supporting me. Coach Seán Kohles and Coach Javier Alvarado have been role models for me ever since I joined Skyline’s team. They are willing to offer advice and support regarding everything that's important to me. They’ve also been a huge help in the college search, application, and recruiting processes. 7) Why has running been so important to you? What have you learned from being a runner? I love running. It’s become a part of my identity and has helped me develop many non-athletic assets, traits, and characteristics that I value greatly. 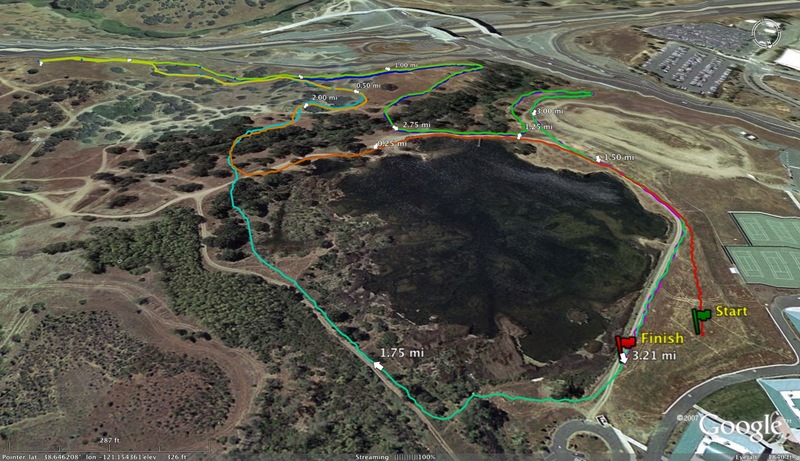 8) Favorite XC course? Favorite XC invitational? Favorite XC workout? Favorite opponent(s)? Favorite long run? Favorite TF invitational? Favorite TF event? Favorite TF workout? Favorite free-time activity? 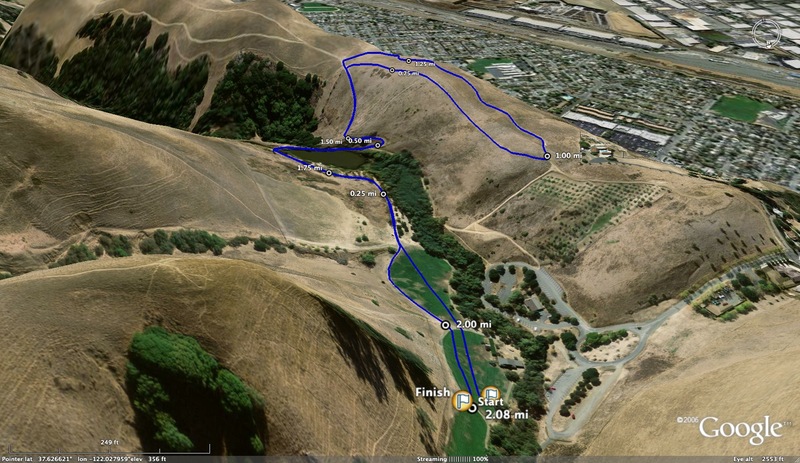 - XC Course: It’s a tie between the Joaquin Miller Park and Skyline HS courses. Joaquin Miller is extremely hilly, but it’s the traditional home of the Oakland Section Finals. Being a part of that history - and not worrying about time - is a blast. 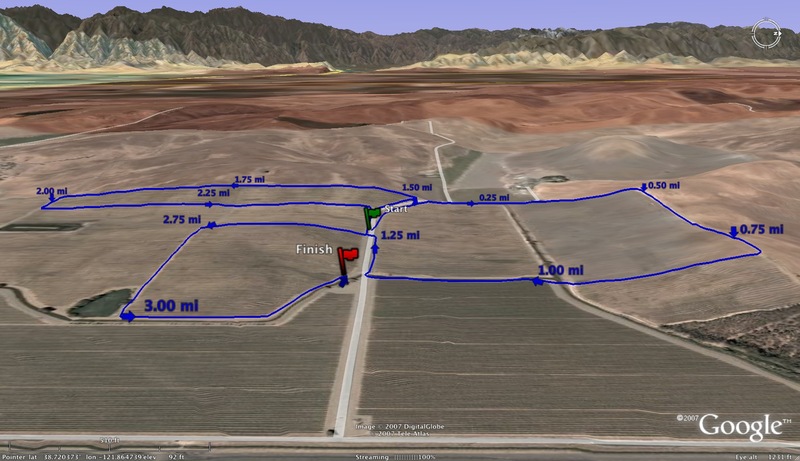 The Skyline course is also hilly but a lot faster, making it a good place for quick solo times. 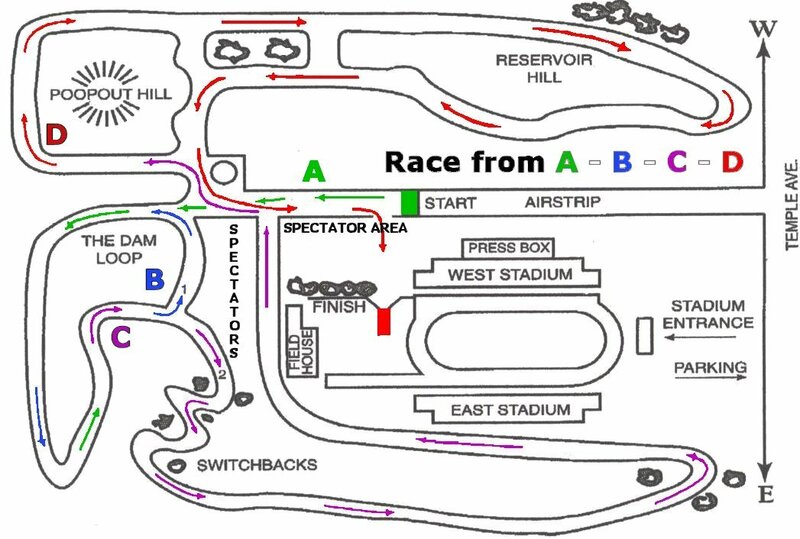 - XC Invite: Ed Sias Invitational. I love the atmosphere of the meet, and it’s a great season opener. Plus, it’s fun to run a 2-mile for cross country. - Opponents: Anyone who presents a challenge. I live for a competitive race. - Long Run: Bayview Trail. Skyline is right next to a number of beautiful city and regional parks, and we’re lucky to have the opportunity to run through them nearly every day. - Free-time Activities: Outside of running, I’m in Skyline’s jazz, concert, and marching bands. I also recently earned my Eagle Scout rank. In my free time, I enjoy playing music, camping, backpacking, and most outdoor activities. 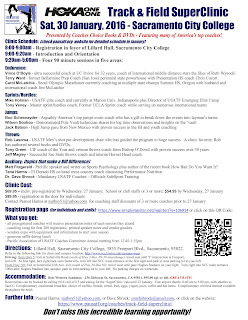 9) Have you decided yet where you will attend college next year? If not, how much of a factor will running be considered when it comes to choosing your next school? I haven’t decided on a college yet. Running will be a big factor in my college choice, but academics and other factors are also very important. 10) Looking ahead to the track and field season, what are some of the invitationals you are really looking forward to and what are some of your goals that you would like to share? I’m looking forward to the Dublin Distance Fiesta. 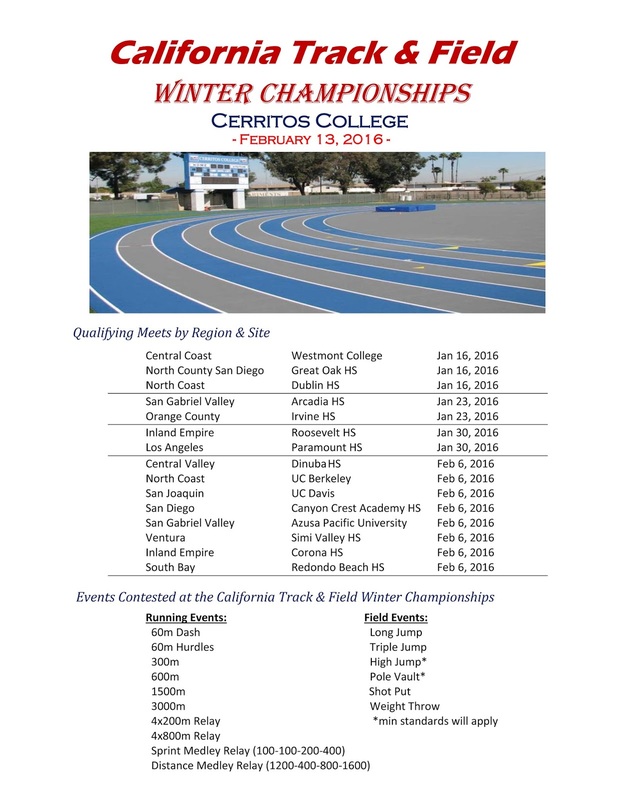 I hope to qualify for and run in the Arcadia night meet. A solid performance at the state meet is another big goal of mine. 11) What is your advice for a young talented runner with aspirations of being a section/state champion in the future? Enjoy the entire process. Mastering any skill is all about repetition. One massive workout or race doesn’t translate to long-term success - it’s finding what works for you and committing to it day after day that leads to results. And success is much more satisfying if you are able to appreciate the journey. What you do outside of training is often more important than you might think. Managing these factors (recovery, injury prevention, sleep, eating, stress, etc.) effectively goes a long way. Trust what your coach(es) have you do, but don’t be afraid to ask why. Special thanks to my family for their support. A big thank you to my teammates and coaches for embracing me as a junior and newcomer to the team and to Coach White and East Oakland Track Group for their tremendous impact on my life. Thanks as well to my fellow team captains and anyone else I may not have mentioned. I’d like to give a shout-out to the Oakland Tech girls team and Johanna Ross for setting the state meet team time record and individual record, respectively, and to the Tech boys team and Nick Kleiber for their school record performances. I would also like to recognize the entire Oakland Section for not only accepting, but thriving on, the recent changes we’ve made to improve our section. Thank you for the interview and congratulations on your team’s success this past season! Greg Wright has reasons to leap over an award he recently received. Over the weekend at the United Canvas of Sling’s National Pole Vault Summit in Reno, Nev., the Lodi High track and field coach received the Coach of the Year Award. Last weekend’s 25th annual gathering, sponsored by the equipment manufacturer, featured the best high school pole vaulters from the United States and Canada competing. To read the rest of this article, go to this LINK. From now on, comments will need to be approved by me before they are posted on this site. When you post a comment, I will get your comment by email and I will approve it unless it's deemed to be offensive in nature. I think this is best considering many of you post anonymously and we have had a lot of comments this past fall that went a different direction from the original intent of this site. I apologize if anybody was offended in any way during this past season. Today we chat with John F. Kennedy (Fremont) senior, David Frisbie (photo to the left thanks to Erik Boal of DyeStatCal). 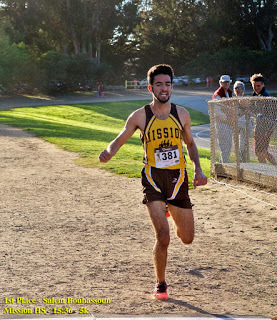 This past cross country season, Frisbie won the NCS Division III race breaking the 15 minute barrier and running 14:58.2 on the Hayward HS course. That time ties him for the 5th fastest time run on that course in NCS Division III action with former Campolindo runner, Thomas Joyce. 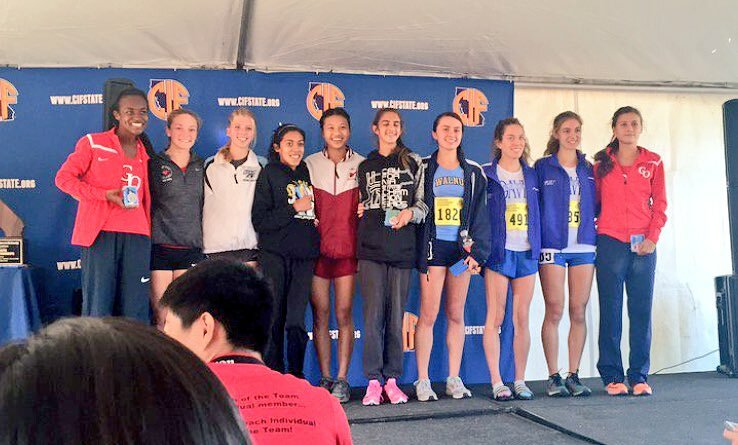 Frisbie followed that race with a 5th place finish at the California state meet with a 15:20.9 finishing time. For his outstanding end of the season, Frisbie made the 1st team all-NorCal team. I probably think that my best race was either NCS or state. Both were great races for me. My proudest accomplishment definitely has to be my NCS win. I finally broke 15 minutes on the Hayward course and added an NCS championship under my belt. Training was a little hard to do mainly because I was training by myself during all preseason and to be completely honest the motivation just wasn't there until I started running with some guys during the regular season. The only thing I did differently was watch my mileage more. Even though my mileage was relatively low all season, I averaged between 50 - 53 miles per week. Same work outs like last season. A lot of mile repeats, 800s and 1200s. A few tempo runs but not a lot which probably wasn't good. Early on in the regular season was pretty rocky for me. It was mostly because I didn't have a lot of base training during the summer. I had a few challenging races. Probably the most difficult one had to be the Stanford Invitational. It was probably one of my worst races but every race after that wasn't so bad. I was determined not to have any races like that and I knew I had to get back on track. I always ran 5 - 6 days a week. Only 5 days if I really needed. Five days maybe 2 or 3 times through out the season. My weekly long runs ranged from 13 to 15 miles averaging 6:30 to 7:00 pace. For interval work, 4:50 to 5:00 pace. Most of my mileage runs were solo. Interval workouts were me and few of my school teammates but mostly guys from other schools and other sections (CCS). Morning runs every Monday and sometimes Fridays before school. Not so much with the weights but a lot of core. It was mostly getting more sleep and watching what I ate but I wasn't too strict although I did watch my protein intake. Overall, no really big changes. The people who have been the most influential on me are definitely my parents but not just them. My current coaches and past coaches definitely play a roll for my success. Al McGaughey, Willie Harmatz, Lee Webb, Mike Dudley, and Jerry Craft. They all took me under their wings and helped me believe in myself, had my back no matter what, been there for me on and off the track, helped me with academics, home life, and of course running. I can't thank my coaches and my parents enough. You guys don't just play a huge roll in my success but also my life. Running is so important to me because I love it so much. Going into high school there was no way I thought I would be getting college offers. Running is now taking me places. What I have learned is to always stay humble. To me, it doesn't matter how many wins you have or how many records you've set, you have to remain humble. That's what my coaches and parents taught me and its something I believe. 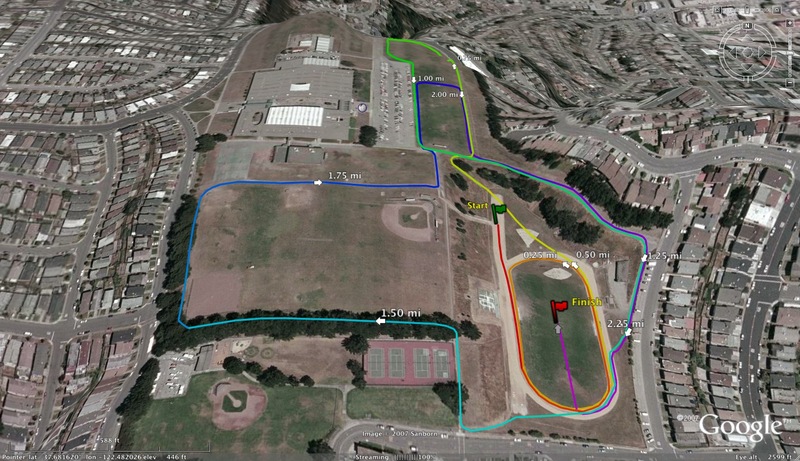 My favorite XC course would have to be Hayward HS course. Not too many hills and not too flat. Just perfect to me. Favorite XC invitational would definitely have to be Mt. Sac. Mainly because I love traveling and it's such a huge meet with great competition. My favorite XC workout is definitely mile repeats on the grass. Lace up the spikes and feeling that lactic acid in your legs. Feels bad but good at the same time. I honestly don't know why. I don't have a favorite opponent. Every long run is a great run. As long as you're out there getting the miles in, it's good for me. Favorite TF invite would have to be Arcadia. Great meet and great competition. Racing against the nations top runners. Definitely 1600. Without a doubt. Favorite work out would have to be 400 repeats. Again, I don't know why but that's my favorite workout. I love to hang out with my girlfriend and go on Twitter and Instagram. If you know me, that's what I do a lot. Lol. I haven't made my decision yet but running in college will play a huge factor. I would definitely like to go back to Stanford and Arcadia invite because those are big meets and I didn't do too well last year. So pretty much just go back and do better than what I did last time. I want to make state in the 1600 and then qualify to the state final. Coach Lee Webb at Logan HS always says "you have to believe to achieve" and that's exactly what I would say. 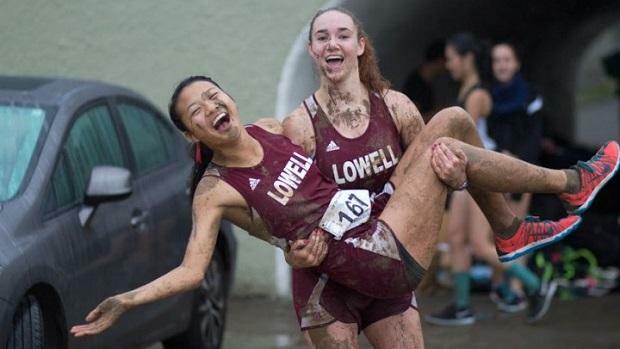 Today we chat with Lowell HS senior, Kristen Leung (Thomas Benjamin photo to the left). 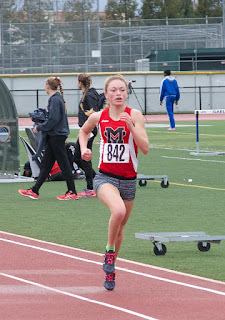 She had a breakout junior Track and Field season highlighted by several outstanding anchor efforts on her school's distance medley relay teams as well as individual times of 4:55.35 in the 1600m and 10:53.11 in the 3200m. 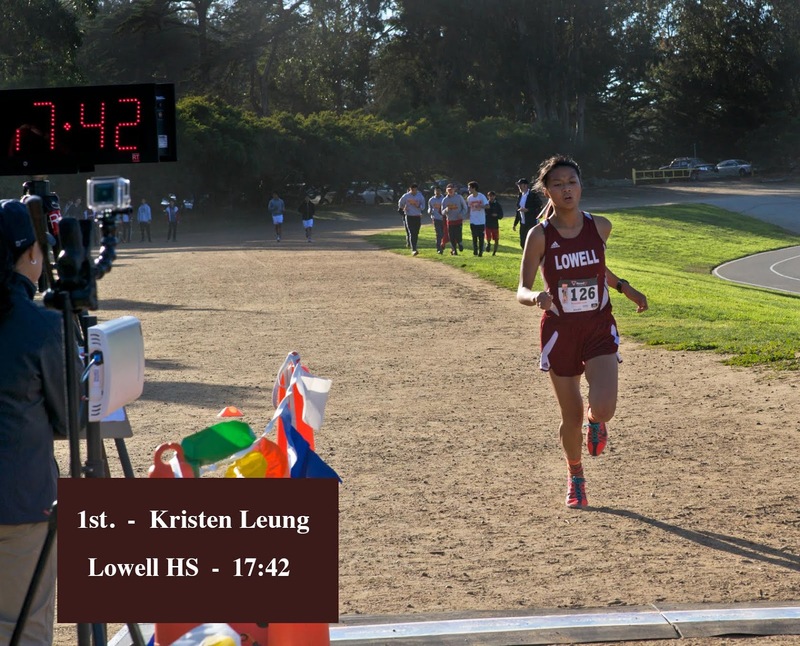 This past cross country season, Leung had a terrific season culminated by a 5th place finish in the Division I race at the California state cross country meet and a huge personal record of 17:35.9 on the Woodward Park course. 1) What sports have you participated in competitively aside from XC and TF? When did you get your start in running? I played basketball and ran the 400m for track in middle school for fun and wasn't very good at either sport. I only had an inkling that I might like long distance running because when I ran the mile for PE, I was that crazy kid who talked during the run and ran extra laps because of the high I got from it. However, I really didn't realize that a person could run more than a couple miles until I discovered running in my freshman year of cross country. 2) What do you remember about your freshman experiences in both sports? Highlights? Oh, I had a blast my freshman year. Everything was so new and exciting.. It was the zaniest idea to me that I could run the same distances that I thought one could only travel by car and explore the beautiful nooks and crannies of San Francisco by running. In retrospect, I think I was the purest runner, running for my love of running, back then before I was exposed to competition. Even though I ran by myself in most of my races, I was innately motivated to push myself to my PRs, and did so consistently. I miss that ability to run at my best without competition, with myself as my biggest competitor. 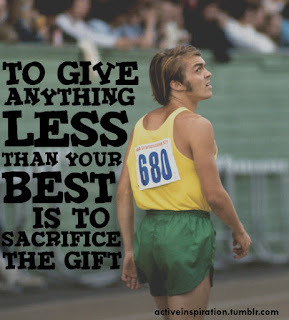 3) Did you do anything differently before your sophomore cross country season over the summer? Before my sophomore cross country season, I ran every so often but didn't really know what to do as a freshman. My team doesn't hold off season practices, and my cross country coach is different from my track coach so there's no one telling us what to do in the summer. It wasn't until the past two years that I've realized the importance of the offseason, trained consistently over it, and organized team practices as a co-captain. 4) Where in your high school career do you feel like you made your biggest jump in terms of improvement as a runner? What do you feel led to your improvement? My biggest improvements have been in the past cross country and track seasons, where I jumped from running a 19:37 at Woodward Park to a 17:35, and a 5:11 1600m to a 4:55. As aforementioned, I didn't realize how big of an impact offseason training could make on my season performances until my junior year. When I did, it led to my successes in those two seasons. My increase in mileage from 25-35 to 40-45 miles per week contributed to my improvements in the past cross country season too. 5) What does a typical training week look like for you? Morning runs? Strength work? Typical long run length? Pace of most of your runs? We do team core workouts at least once a week, and I try to fit in a few strengthening exercises after every other run. 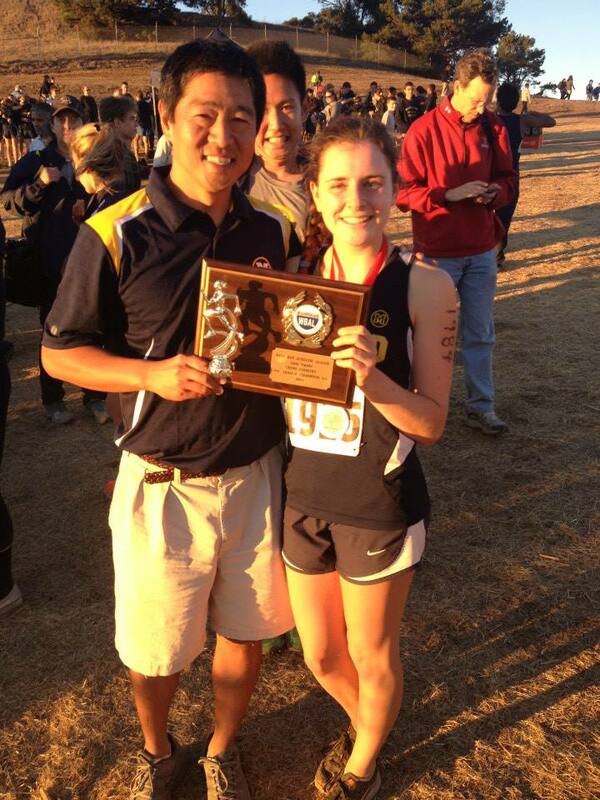 6) You have different coaches during your cross country and track and field seasons? Is that something you are used to now or is there a transition period every season? Having different coaches for track and cross country is not really something I have had to get used to, as it's just something that has always been. I actually like the situation. Having different coaches offers variety in training philosophies and attitude. One of the coaches is more focused on competition, while the other is more focused on offering his runners enriching life experiences. The only real downsides are the offseason where we have no official coach, and that the two coaches don't particularly like each other because of a feud they had a number of years ago...it's like having divorced parents. 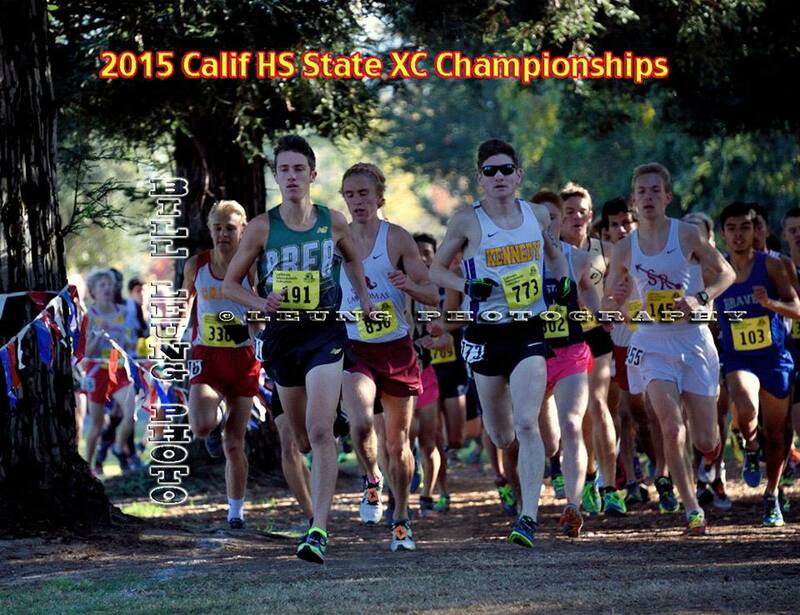 7) You finished in 5th place at this year's CA state XC Division I race running 17:35.9. During your first three state meet appearances, you finished in 127, 122 and 115 respectively. What was your goal heading into this state meet and why do you feel, you had such a dramatic improvement? Well, for starters, I've never really performed at my best at state meet for various reasons. It's at the end of the season, my team tapered too much/too early, I was injured, ate too much, etc. But, as all the cross country t-shirts tell us, there are no XCuses. I buckled down this season and stopped making them. *Tapering smarter- I did some funky end of the season stuff in the past... 200m "easy" workouts, nearly a month of easy running... it clearly didn't work. As to what my goal heading into state was, I was unsure of what to expect. We used to estimate our state meet times would be a minute faster than our home course times (the SF section course was extremely difficult), but our course changed this year so I didn't have much to go off of. I hadn't faced competition during the season. No runner from my section has ever placed better than 10th. Even running blogs like yours said I was a wildcard, and, honestly, I didn't know what my full potential was either. However, the uncertainty of my abilities freed me from external pressure to perform that runners often get psyched out by and I lightly decided to myself to shoot for my Mt. SAC time (17:36), because I felt I could, and/or place in the top 10. I ended up exceeding my expectations and doing both. 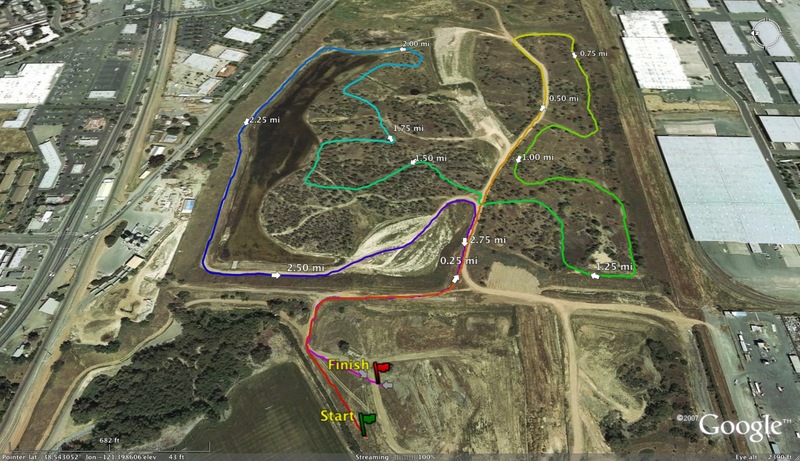 8) Favorite XC course? Favorite XC invitational? Favorite XC workout? Favorite long run? Favorite track event? Favorite track invitational? Favorite track workout? Favorite Lowell tradition? Favorite free time activity? It was my team's first time going down to it this year, and we heard so many scare stories about it, but I ended up loving the course. It felt like it was made for cross country with the challenging, fun switchbacks and hills in just the right places during the race. Loved the cute posters from Brooks throughout the race too. The best races are the ones that make it fun. Lowell has only gone once while I've been here, but we team had the best time ever. We flew up to Portland, got to explore the city, karaoke, stay at a fancy hotel...we made so many good memories there. To top it off, the Nike people treated us well, with a tour of the Nike campus, a dinner with all the competing teams, and a Q&A session with Jordan Hasay. We didn't even mind the pouring rain, mud, and hay bales we had to jump over on the horse track the race was on. Favorite XC workout: Our assistant coach introduced a new workout this year where you have to run 800m or 400m repeats, getting the same time or better each repeat. If you are off your time more than once, you end the workout. The real challenge- no looking at your watch! Favorite long run: Any long run with the team. The biggest goofballs I've ever met are on the team, and we always end up having these hilariously nonsensical conversations during runs and discovering beautiful parts of San Francisco. The other team captain brings along speakers and we all bellow Taylor Swift songs. 9) Do you have any good (humorous) Andy Leong stories that you can share with my audience? 10) Have you decided what college you will attend next year? If not, how much will running be a factor in your decision? Nope, not committed yet. Before the past year, I couldn't imagine being a collegiate runner, but life takes us to unexpected places and now I can't imagine NOT running in college. However, I'm looking for a balance, and don't want training to be so overwhelming that it hinders my academics, and vice versa. 11) Looking ahead to the track and field season, what races are you most looking forward to and any goals that you want to share? In the past, I've trained mostly for middle distance because my team had a strong DMR (4th fastest time in the nation last year!) 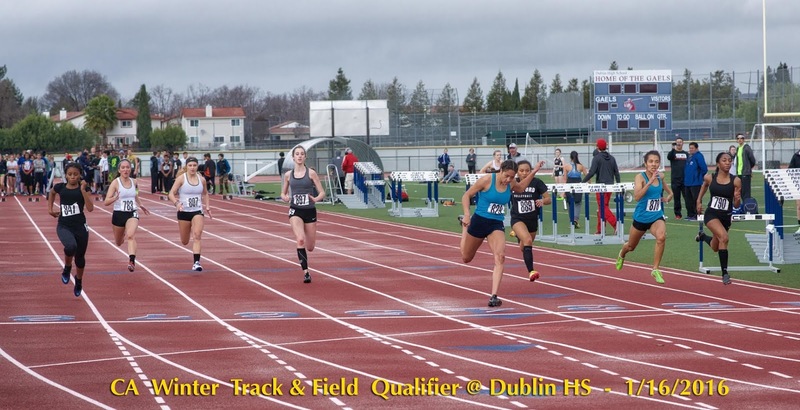 and 4x800m, but with my successful XC season, I'm hoping to focus on longer distances more and run the 3200m at the Dublin Distance Fiesta to (hopefully) qualify for the Arcadia Invitational 3200m. In my best event, the 1600m, I'm aiming to sub 4:50, which isn't too far off from my current PR of 4:55. It definitely takes a hard-working, determined runner to be successful in cross country, but one has to pay respect to the huge amount of luck that is involved in any success. I am blessed to have such a supportive circle of coaches, family, teammates, and friends who inspire and encourage my running. I wouldn't be where I am today without them. Thank you for reaching out to me for this interview and for all the work you put into this blog! I love reading about fellow runners and updates in world of NorCal XC, and it's an honor to be a part of it. Alameda Mayor Trish Herrera Spencer visited#SJND today to make a special proclamation for one of our student athletes. 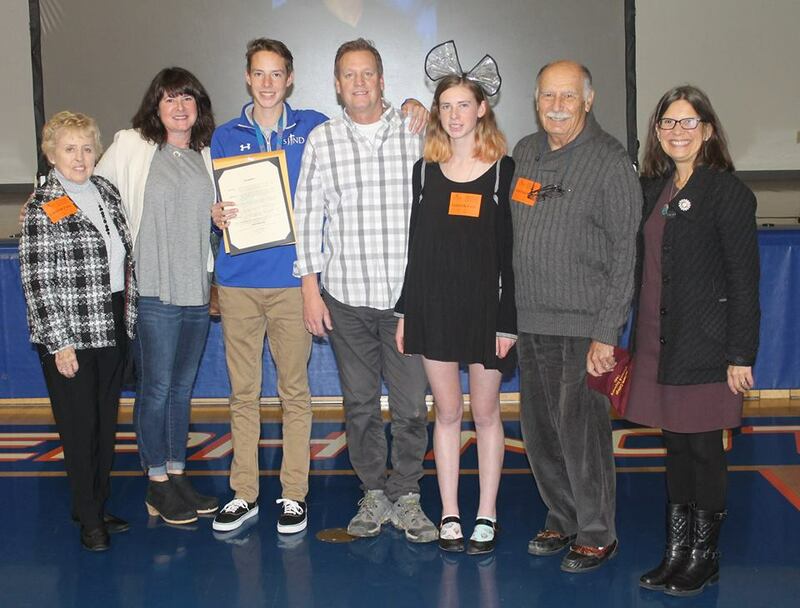 For his accomplishments and success this cross country season, Mayor Spencer proclaimed January 15 as Cooper Teare Day in Alameda! A huge congrats to Cooper '17 and his family. Long Jump-Isaiah Holmes Oakmont (SJS) 23'9", Anthony Cable Rodriguez (SJS) 23'5.5"
Triple Jump-Isaiah Holmes Oakmont (SJS) 48'3.25", Darius Carbin Mt. Pleasant (CCS) 47'4"
High Jump-Darius Carbin Mt. 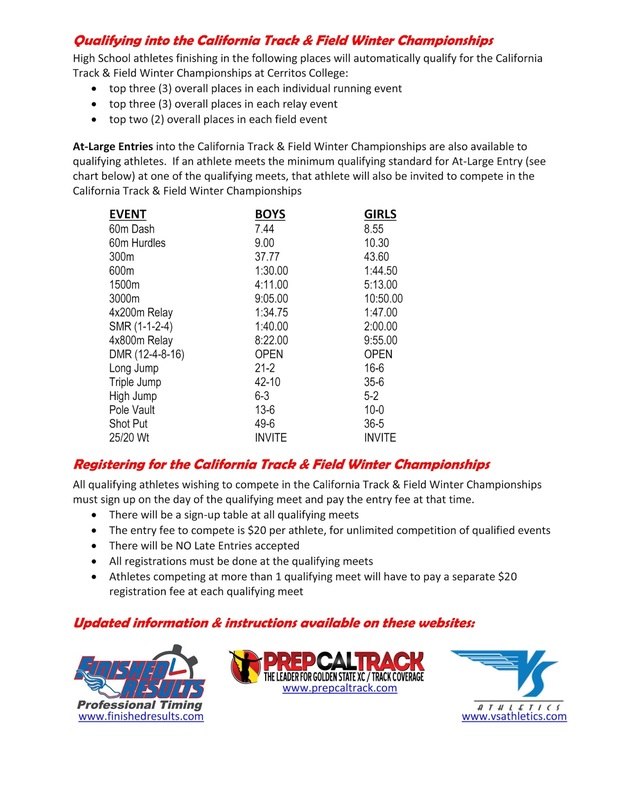 Pleasanta (CCS) 7'1", Isaiah Holmes Oakmont (SJS) 7'0", Darius Thomas St. Francis (CCS) 7'0"
Pole Vault-Michael Gonzalez Lodi (SJS) 16'0", Jacob Bowler Del Oro (SJS) 15'9"
Shot Put-Jonah Williams Folsom (SJS) 60'10.25", Nate Esparza Amador Valley (NCS) 60'6.25"
Discus-Nate Esparza Amador Valley (NCS) 177'7", Jake Kenney Wilcox (CCS) 167'7"
Long Jump-Katherine Jackson Rodriguez (SJS) 19'10.5w, Caice Lanovaz Los Gatos 18'11.5"
High Jump-Julie Zweng Scotts Valley (CCS) 5'6", Kaylee Shoemaker Corning (NS) 5'6", Olga Baryshnikov Prospect (CCS) 5'6"
Shot Put-Elena Bruckner Valley Christian SJ (CCS) 53'5'5", Jasmine Pharms Stagg (SJS) 43'10"
Discus-Elena Bruckner Valley Christian SJ (CCS) 182'8", Hannah Chappell Oakdale (SJS) 151'2"
The meet will happen rain or shine. Please have your student athletes fill out our online form found at http://www.dublincrosscountry.com/Dublin_Track/WT%26FCS.html. It will close at 9:00 PM on Friday, January 15. ATHLETES THAT HAVE FILLED OUT THE ONLINE FORM: You will receive your bib number at the athlete gate upon your entrance into the stadium after paying you entrance fee of $10. Please let the gate know that you filled out the online form and they will give you your number there. You do not need to go to the registration area - you are ready go! ATHLETES THAT DID NOT FILL OUT THE ONLINE FORM: After you pay your $10 entrance fee at the athlete gate, you will be redirected to the registration tent to turn in your SIGN-UP SHEET (which is available at the above link) to get your bib number. This line can get long so if you do not plan on doing the online form, arrive early enough to wait in line and get your form processed well before the meet begins. 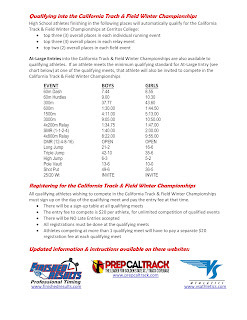 "The high school division only meet will begin at 2PM rain or shine this Saturday. The Meet Information, Individual Sign-Up Online Form, the Individual Sign-Up Paper Sheet, and the Relay Sign-Up Sheet are at http://www.dublincrosscountry.com/Dublin_Track/WT%26FCS.html." Please list the athlete, coach or any other person associated with either cross country and/or track and field in the comment section below. If you have their email address, please send it to me at albertjcaruana@gmail.com. Please use email above if you would like me to interview an athlete or coach. Thank you. In the comment section below. What do you want to accomplish in the upcoming Track & Field season? Be specific. You don't have to add your name. The top 6 qualify to the state meet from the Southern Section unless you can qualify by surpassing the 2016 At-Large Time Standards. Feel free to comment below on athletes that I missed and should be added below. USATF Coaching Education is offering a Level 1 School in your region. For further information and to register, click here. 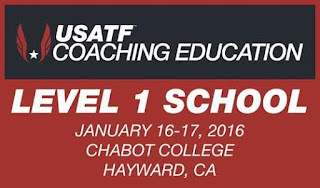 Register by midnight (EST) on January 9th, 2016 for the pre-registration price. 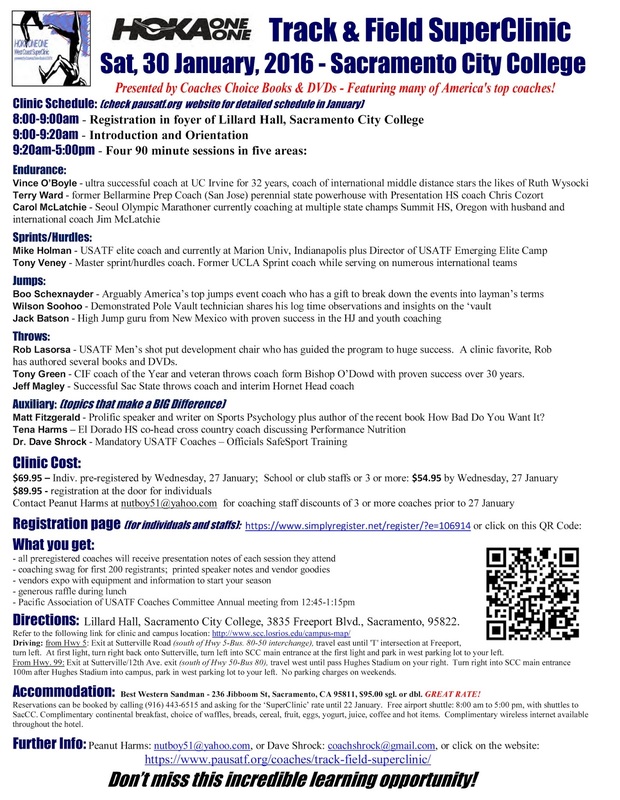 Current World Record Holders Mike Powell and Kevin Young will be at the clinic as well as many other former World Record Holders. There may never be a gathering like this is the future! Olympic Year. Come support Track and Field. 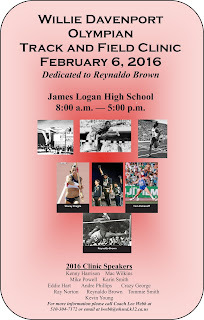 The clinic is dedicated to Reynaldo Brown. Coach Jim Santos will be recognized for his longtime dedication and achievement to the sport! Covering High School Track & Cross-Country in the Redwood Empire. 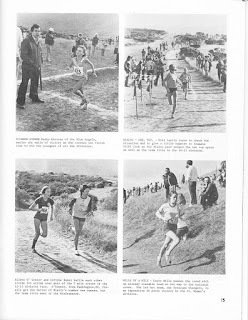 For those of you that were faithful visitors to Jim Crowhurst's sites that covered Cross Country and Track & Field in the Redwood Empire (NBL, SCL and CMC), you are in luck. Jim has the site back up which you can find at the link below. The site includes tons of statistics dating back many decades and will be a great resource for those 3 leagues for this coming track and field season. The site is no longer associated with the Santa Rosa Press Democrat so donations are welcome to help with the upkeep of the site. Check the link on the site for more information in regards to donations. Please note that the Inland Empire meet held at Corona HS on February 6th has been moved up to February 23rd.